I have a confession to make: I’m a lazy writer. Not lazy in the sense that I do not work hard, but lazy in that I tend to choose the easiest watches to write about, i.e., watches that are highly complicated; watches with sensational finishing; and watches that look like nothing else on earth. While the vast majority of the watch-buying public tends to purchase round watches displaying hours, minutes and seconds, with perhaps the odd date or power reserve indicator thrown in for good measure, I tend not to write about those more “normal” types of watches. For me, writing about these more standard, albeit extremely popular, watches is hard work, requiring delving into the minutiae differentiating them from their near-identical − brand names aside − competitors. Yes, I write about the watches that interest me and, yes, it is easier writing about what I find interesting. However, it’s a lot easier for me to explain what makes a watch like an MB&F HM4, for example, so special, compared to say the latest Rolex GMT Sea-Dweller. And, as a picture is worth a thousand words, there’s often less that needs to be said. Not only are avant-garde watches easier for me to write about, you are more likely to read about them as well. Just as you are more likely to pause at an article on the latest Ferrari or McLaren rather than the new Toyota or Hyundai. Articles about wrist-borne intergalactic spaceships or über-complications are both easier to write (for me, anyway) and more likely to be read. As goes writing about watches, so goes designing watches. When you are a small boutique brand trying to be noticed within an ocean of large, established brands with massive marketing budgets, it helps to be different . . . the more different the better. This strategy doesn’t work if your plan is to sell thousands of watches because the vast majority of collectors are conservative in what they buy and generally refrain from handing over their hard-earned cash for crazy-looking, anything-but-round creations. But when you are a boutique brand like MB&F, you don’t need to − and, in fact, MB&F founder Maximilian Büsser has no desire to − sell thousands of watches, so making wildly unconventional, science-fiction-inspired, niche watches has paid off. And MB&F has gone from strength to strength. Aside from its radical watches, MB&F’s success can in part be attributed to “lazy” writers like me, in addition to my more industrious colleagues, who find it easier to highlight the attractions of an in-your-face MB&F Horological Machine than the latest round Tudor with three hands (no offence to Tudor intended). So we all got used to a steady stream of alien horology from MB&F, and lots of journalists like me happily wrote about the brand because it was easy to write about. And everything was going hunky dory until 2012, when Büsser pulled the rug out from under our collective our feet (and not for the first time) by presenting a round watch. A round watch from MB&F? Why on earth would MB&F present a round watch in the form of Legacy Machine No. 1 (LM1)? The answer is simple: Maximilian Büsser likes a challenge, and in horology there is perhaps no bigger challenge than creating something revolutionary in a traditional round case. My first reaction wasn’t, “Wow, that’s a bold move,” but rather, “Damn, I’ll have to work harder to generate interest in a round watch.” Disclosure: I wasn’t just thinking as a journalist here, I was also responsible for writing the LM101 press release. However, luckily for me − and unsurprisingly from MB&F − LM1 turned out to be anything but just another round watch. With an enormous balance wheel suspended over two completely independent dials plus the world’s first vertical power reserve, LM1 was not only eye-catchingly wild enough to be clearly identifiable as an MB&F Machine, it was also traditional-looking enough for those looking for a milder dose of horological adrenaline than MB&F’s more typical fare. Which all made it easy to write about, so many did. Myself included. Legacy Machine No. 1 was a risk for MB&F, but it turned into a gamble that paid off, with LM1 winning the hearts of a great many watch collectors, as well as quite a few prizes, including not one, but two awards at the 2012 Grand Prix d’Horlogerie de Genève (GPHG): the Public’s Choice and Best Men’s Watch. Following on from Legacy Machine No. 1 was the even more complicated Legacy Machine No. 2. It showcases two suspended balance wheels whose rates are averaged by a planetary differential gear. Just when we might next expect to see Legacy Machine No. 3 featuring some new and unusual take on another traditional complication, this being MB&F, we get the complete opposite: a pared-down version of Legacy Machine No.1 called LM101. The designation “101” derives from the fact that this model is pared down to just the bare essentials of what is required in a mechanical wristwatch: hours, minutes and a power reserve indicator (flat, though, not vertical). The suspended balance leaves no doubt that this is a Legacy Machine and, at 40 mm, the case diameter of LM101 is smaller than the 44 mm case of LM1, making it a much better fit for smaller wrists (like mine). So it looks like MB&F has basically taken the easy way out in extending its range of watches by offering a smaller, simplified version of an existing model. The lazy way out. Nothing wrong with that, I suppose. It’s cost-effective and the majority of brands do the same thing over and over again with minor tweaks. But it’s disappointing, nevertheless, as I expect more from MB&F than I do from the majority of brands. Never fear, though: there’s more to LM101 than first meets the eye, much more in fact: a completely new movement! LM101 does have a round case like LM1. LM101 does have a suspended balance wheel like LM1. 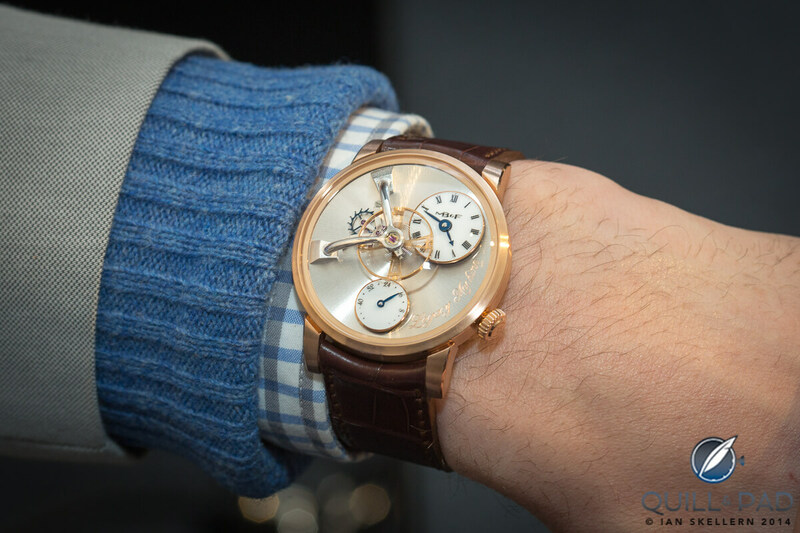 LM101 does have similar movement design, bridges, finishes and even Kari Voutilainen’s hand-engraved name on the back. LM0101 does not have the same movement as LM1. LM101 doesn’t even have a highly modified version of the LM1 movement. LM101 has a completely new movement, designed and developed in-house by MB&F. LM101 features MB&F’s first 100 percent in-house movement. There’s nothing lazy about that, just the opposite, in fact: developing a new movement is about as difficult as watchmaking can get. A stunning suspended balance wheel that looks even larger than that on LM1 due to this watch’s smaller case diameter. A very high, domed crystal allowing full view of the dial’s three-dimensional elements from the sides as well as the top. An elegant, white, slightly domed hour and minute subdial balanced by a similar subdial for the power reserve indicator. Absolutely stunning hand-finishing and movement design. Plus a completely new in-house movement. And here I was worried I’d have to do a bit of work writing about Legacy Machine 101, but it’s been easy. So I have another confession to make: thanks to LM101, I’m still lazy! For more information, please visit www.mbandf.com/machines/legacy-machines/lm101/. A “Jean-Paul” left a couple of comments at the bottom of this article expressing his view that the LM101 movement, which MB&F claims to have developed in-house, was basically the Chronode LM1 movement with a few reshaped bridges. “Jean-Paul” accuses MB&F of not really developing a new movement at all for the LM101, but simply cutting out the “middleman” (Chronode) behind the LM1 movement and banking the profits. Let’s leave aside possible motives for the comments of “Jean-Paul” for the moment. And let’s leave aside the fact that as the LM101 is more than 30 percent cheaper than the LM1, any cost savings generated by cutting out the “middleman” appear to have been passed to consumers rather than banked by MB&F. Instead, let’s take a look at the two movements and see if we can work out for ourselves if LM101 basically uses the LM1 movement minus a second time zone or if we can validate MB&F’s claim to have developed a new movement. The main thing to look for when comparing movements are the positions of the pinions and axes of the wheels. Movement plates and bridges can come in all shapes, sizes and finishes and can make two technically identical movements look substantially different. First, let’s look at similarities and differences in the dial layouts. Similarities: central balance wheel, power reserve indicator at 6 o’clock, position of winding stem. Differences: position of hour and minute subdials, position of escapement. Personally, I could not definitely state that these two dial layouts required two completely different movements. 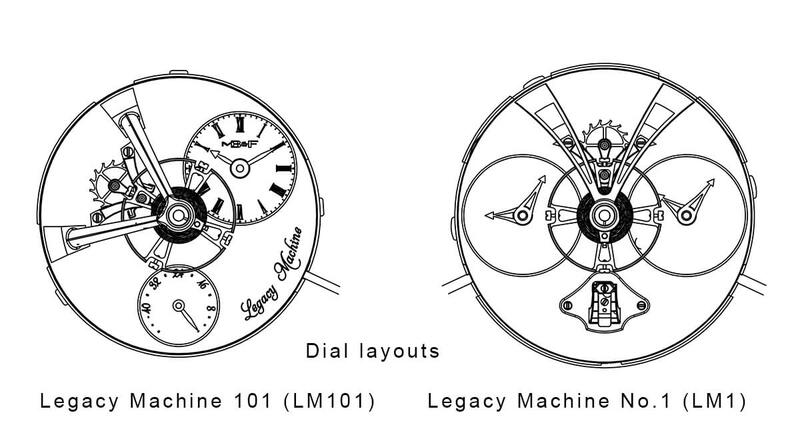 Different, yes, but from the dial layouts alone, the movement of LM101 may, in my view, have been derived from LM1. So let’s have a look under the dial and see if the differences, or absence thereof, become clearer. But then, of course, that’s what the MB&F movement constructor would say, wouldn’t he? Let’s take a closer look for ourselves. With the LM101 movement (in red) overlaid on the LM1 movement, there does not appear to be much in common except the position of the spring barrel and wheel in the center. Well, looking at the axes of the wheels and pinions of the overlaid movements (LM101 in red) above, I think that’s game, set and match to MB&F. Apart from the barrel and that central wheel (and where else can the latter go? ), the movement of Legacy Machine 101 is very different to that of Legacy Machine No. 1. And while I’m not sure of “Jean-Paul’s” motives for expressing doubt, I am happy that he provided an opportunity to look a bit deeper into what I feel is an interesting topic. Well articulated, Ian! Like you, I was a bit of two minds upon first viewing this piece in January but agree strongly with you that the “differences” between this one and the prior LMs are quite meaningful. And I predict that with its more accessible size, great design and finishing, and fidelity to the established LM design codes, it will prove very popular with collectors! Thanks, Gary, I’m sure the 40 mm case size will be quite popular as there are a lot of collectors out there that like Legacy Machine No.1, but find 44 mm just too big. There are quite a few ladies who might find 40 mm fits just nicely as well. Indeed, Ian, I’d have to say that was probably my only problem with LM1: the size. I do have quite a crush on this version as it really fits my wrist so much more nicely! Well, IMHO it is a lazy watch in many respects but MB&F has the right to be lazy from time to time (like other brands) and just make some (more) money. They run the company like a business not a religion. This watch is an item meant to be sold, nothing more and nothing less. Making it quick and dirty (and smaller) here is smart and will maximize the profit. But why trying to justify it with claims like “totally new”, “in-house”… Are we all fools? So the movement is supposed to be new. On a closer inspection it is obvious that the gear train, the barrel, the ratchet, the balance wheel, etc. are all identical with the ones from LM1. Obviously the bridges and main plate have a slightly new design but this does not make the movement new at all, just slightly different. Therefore Chronode’s (maker of the LM1 movement) DNA/fingerprint is still obvious. What was nice and fresh about MB&F was that they never tried to be a so-called manufacture and worked with skillful friends (not like the big nasty companies …. pure marketing talk of course). MB&F was supposedly a think-tank, a “concept” and did not need to have a factory made of bricks to be legitimate. What as changed now? Do they now own a good old factory with dozen of workers like the big players? What has changed here compared to the production process of the LM1 movement? What exactly does “in-house” mean in this context? Do they now produce any component themselves in their own workshop without their good old friends? For me it might be a proprietary movement but (all) the parts are probably sourced from third parties. Nothing wrong at all about that but I just don’t see the difference here with the LM1, which was a proprietary movement as well. Before it was Chronode sourcing and assembling the components and now it seems to be MB&F itself. They cut the middleman (former known as “friend”) so to speak which does make sense economically and will certainly increase the profit. First they needed Chronode and now they don’t need it anymore. That’s fine. Nonetheless, this move alone does not transform the nature of the movement for me and make it either “new” nor “manufacture”. Hello, Jean-Paul, and thank you for your obviously passionate comment. However, I have to point out that your deductions and conclusions are totally incorrect. 1. If you look closely, more closely than your first look, you will see that while the bridges and finishing of LM1 and LM101 have similar styles, the movement layout is totally different. I encourage you to have another, more careful examination of the positions of the jewels and the wheels. 2. There are no Chronode “fingerprints” at all on LM101 and while it’s a reasonable, but wild, guess that MB&F just cut out the middle man and basically assembled the movement themselves rather than have Chronode do it, that’s again incorrect. The LM101 movement is not at all a derivation of the LM1 movement. 3. What has changed is that MB&F has a movement designer/constructor, Guillaume Thévenin, who has been working at MB&F for approximately 2.5 years now. After successfully developing additional complications and functionality for existing movements, they thought Guillaume was ready to develop the complete movement for LM101 and the decision paid off. The movement is excellent. 4. If you look toward the end of the full LM101 press release – you can download that at http://www.mbandf.com/machines/legacy-machines/lm101/press/_texts/LM101-ENGLISH.pdf – you will see the list of “Friends” involved in the project, including those responsible for the movement design, manufacture of components, finishing and assembly. As I said in the article, you will also see my name in that list of Friends as I wrote the LM101 press release. I can assure you that while I do my best to put a nice story on a press release text to hopefully increase the chances of the text being read, I do not take what anyone in the company, including Maximilian Büsser, tells me at face value. I do my own research and happily challenge anything that seems unlikely, unreasonable or unsubstantiated. And I’ve always been encouraged by Büsser to do just that. 5. MB&F never claimed that LM101 is a “manufacture” movement, a term I think you have confused with “in-house.” Again, check the list of Friends on the LM101 press release and you will see who manufactured what. I know of no other brand that is so transparent in regards to suppliers. MB&F developed, i.e., designed, the movement of LM101 themselves “in-house,” they did not and never claimed to have manufactured all of the components. In your defense I will say that because the styles of the LM101 and LM1 movements are so deliberately similar, your mistake was an easy one to make. And I do respect your right to take anything or everything I’ve said above with a healthy dose of skepticism. What I will do is see if I can get technical drawings of the LM1 and LM101 movements and overlay them so that you can see more clearly how different the two movements are. And again I thank you for your comment. If you feel that the LM101 movement is derived from another, then I have no doubt that so do others. By sharing your opinion with us here you provide an opportunity to clear up that misconception and elucidate the facts. Thanks a lot for your extensive answer. Please allow me to explain further what I mean by identical/similar movement. As I wrote, for me, the ELEMENTS/COMPONENTS like the gear train (i.e all the wheels), balance-wheel and escapement (inertia, pointage), barrel (size, power), etc. seem to be identical to the LM1. I did not claim that they were placed/dispatched exactly the same on the main plate. What technically defines/characterizes a movement are its balance wheel/escapement, gear train and barrel. If all these elements are the same, then the movement has the same DNA/fingerprint. It is not because you place/dispatch the wheels differently on the main plate that the movement becomes entirely new. Take for example watchmaker students, they often take the gear train of the UNITAS/ETA 6497 and make a new base plate (and bridges of course) to have a different layout. For instance they move the second to another place. Nonetheless they would not claim that their movement is entirely new as the core elements are the same/taken from another movement. As you know, a lot of independent watchmakers use existing gear trains/escapements and make a movement of their own with it. Nothing wrong/bad at all as to develop a new gear train/escapement/barrel is highly difficult/expensive and a good ETA base is very hard to beat. What I just wanted to say is that the movement does not become new by moving some wheels and other elements. But again, this is not a critic and MB&F does a great job and developing a new gear train, etc. for the LM101 would have made no sense at all. It is more about how you present things and maybe how you define the words “new” or “in-house” (which for me is, by the way, a synonym of “manufacture” while you seem to differentiate both). I agree with you 100% Jean-Paul, using or modifying an existing gear train is not at all the same as claiming to have designed the complete movement. And if you go through a few of the MB&F press releases you will see that they clearly state when the movement uses a third-party gear train, no matter how much other work has been done. In the Friends section of the HM3 press release, for example, it states that the oscillator and gear train come from Sowind (Girard-Perragaux’s movement company). I understand the term “in-house movement” to mean developed and designed internally by a brand, and “manufacture movement” to mean developed, designed and most of the components produced by the brand. What MB&F (and myself) are saying is that the gear train of LM101 was not derived from the gear train of LM1. You obviously don’t believe that, as is your right, but I suggest holding off further discussion until I can get some technical drawings we can compare. These should either prove you have made an honest mistake or cover my face in egg. I have to say that I love the update. I could pretty much tell most of that from looking at the two movements before, but having it all clarified with the overlays was awesome. New movement, new watch, another item on the wish list! Great work, Ian! Perhaps Jean Paul is not 100% percent correct; but I am also not convinced for several reasons that ‘everything is new’ here. On the dial side, everything has simply been rotated and the sundials shifted off-axis. In itself not really anything new. Furthermore, using a central point for comparison of a caliber that has been made smaller is also a bit ‘smoky’. Fact is, constructors use highly advanced programs and also can work sectionally, developing certain smaller areas within the design layout. And they can also ‘flip’ structural features. If you look at the three large red circles in the middle and flip them in mirror image, they will more or less align with the black circles. Constructors don’t work purely from a central axis. For, me it is by far not 100% new, but also not 100% old. What I see is a movement where parts were simply placed in different areas to create a different diameter caliber. And it is this aspect that is perhaps the letdown for those expecting more from MB&F to begin with. On a purely subjective note, I find it unattractive, a bit like Haldimann meets Breguet, with a jarring techno finish combined with 19th century enameled sub dials. Anyway, it is easy for us to judge someone who has worked hard to accomplish something; I juts wish Max would find more coherence with his entire collection as a totality…..
Hello, Rushwarp, and thank you for your comment. While I appreciate that liking or not liking something can be purely subjective, my aim in comparing these movement drawings was to reduce wild speculation by providing real data. How do you think that comparing using a common center point was “smoky”? What other point of comparison would you have thought would be clearer? While it is easy on a sophisticated technical program to simply reduce the scale/size of components, this would encompass ALL new smaller components and this clearly is not the case with LM101 as the two movements share the same size mainspring barrel. I agree with you that a movement might fairly easily be rotated slightly, or inverted and be essentially the same while looking quite different. But you have basically suggested that the LM101 has been created largely by making the LM1 movement smaller AND inverting it AND rotating some (but not all) components. I actually tried all combinations of these (and more) in Photoshop and could not even come close to matching any of the components. Again I thank you for you interest. Well, I remain unconvinced, with different results, and we can get into a (in my view) rather extended discussion about movement design; however since I don’t personally like the watch, I don’t feel any need to prove or disprove anything, and as I already clearly stated I leave it in the middle…You yourself state that the going train and barrel are the same, I can see the dial layout is virtually the same, etc. Ergo, it is not a 100% new movement. Without realising it perhaps you are convincing yourself by mentally counting percentatges (yes that is all borrowed but…) Why, and who cares? It is not 100% totally new but certainly partly so; I leave that discussion at 50/50, and my meaning is purely subjective. If people like the watch they should purchase it and ignore all these discussions and my views! What remains at the heart of the issue and real problem for me (and others) is they fact that the dials of both are virtually identical, with the large bridge turned and the sub dials shifted over off axis to accommodate the new movement interpretation. You have stated yourself that you have worked for MB&F and it is natural that you defend the new timepiece as being so novel, which is natural, expected and human; all watch lovers here can be forgiven their personal prejudices, etc.. However, if Lange, in a fantasy situation, had taken a Datograph, and created a smaller version by simply rotating the dial, and shifting the subdials off to one side, revamping the movement and further keeping essentially the same color, design and layout features, I am pretty sure many watch cognoscenti would respond with the same lack of enthusiasm as myself, and they would also suspect that the changes made in the dial were purely the result of having to revamp an existing movement (for 30%, 40%, 50%, 60% or ???) into a smaller case – not because the dial was more beautiful that way. And that is at the heart of JP’s (perhaps indelicately stated) points and my own feeling (I do not know JP by the way), namely: at such high levels of watchmaking, collectors such as myself and others have the right to expect a lot more than what looks like a timepiece composed of compromises…. Hi, Rushwarp, you certainly have the right to your own opinion. Just one thing I’d like to correct, though: I said that the mainspring barrel (one component) was the same in both LM101 and LM1, not the going train. If the going trains were identical (or very similar) then I would agree 100% that the movements were basically derived from the same design. I wouldn’t put too much store in judging movements by dial layouts, though. Not unless you think that because every round watch with central hours, minutes, and seconds have similar (or near identical) dial indications, that that implies that they all basically have the same movements as well? Watches are like cars: you can’t always tell what’s under the hood by the number of wheels and doors.